The realm of 3-D printing is one that continues to bear watching. A few months ago there was some legal action taken by Games Workshop in regard to a printable 3-D version of one of the company's more iconic models. At the time I remarked that the "Dreadnought" in question was worse than lame, that it was craptacular. I quietly wondered how long would it be before the quality of this kind of thing would catch-up to traditional molding and casting. From computer scientists at Harvard University comes some new software that will let you print highly-detailed and fully-ARTICULATED action figures! And it's pretty insane how the software does it too: it takes an animated 3-D character and automatically figures out where all the movable joints will be, and figures-in how to manufacture those joints in a real-world model. In other words you could take a picture of Shrek and turn him into a fully poseable toy. Or print your own Star Wars: Clone Wars action figures. Which no doubt Lucasfilm's licensing department would have something to say about that (and you thought Games Workshop's lawyers were bad...). But all the same, the Harvard thinkin' dudes are planning to make their software available commercially. Eventually. Click on the link above for some groovy pics and video of the process in action. And then there's this lil' application of 3-D printing that's sure to put gun control nuts into conniption fits: The world's first 3-D printed gun. Yes, it really works too. Apart from the chamber (which remains solid metal), this .22-caliber pistol is entirely printed plastic. 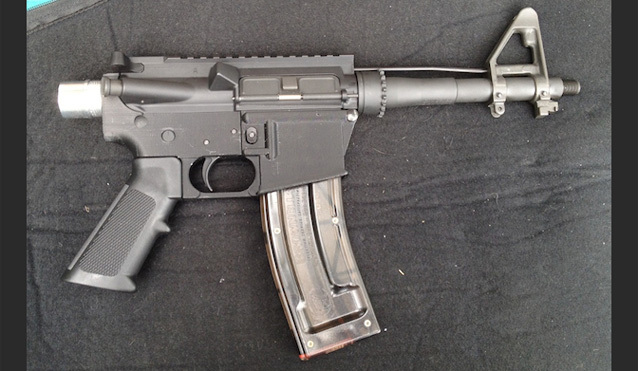 It fires 200 rounds with no apparent wear or damage to the weapon. It was manufactured with an older 3-D printer and about $30 of resin, but its gunsmith - who goes by the Internet nom de plume "HaveBlue" - reckons that it could be made for as little as ten bucks. I can already envision some politicians are going to hear about this and decide "something must be done about it, think of the childrun...!" Print me up a couple of old German ww2 panzer tanks, will ya? I have a small town to invade in the morning.